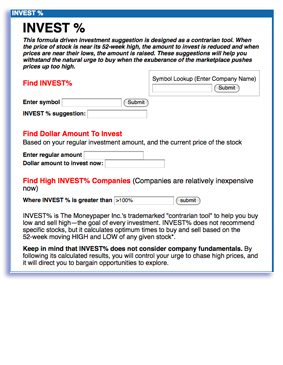 INVEST% is The Moneypaper Inc.'s trademarked "contrarian tool" to help you buy low and sell high--the goal of every investment. INVEST% does not recommend specific stocks, but it calculates optimum times to buy and sell based on the 52-week moving HIGH and LOW of any given stock*. Keep in mind that INVEST% does not consider company fundamentals. By following its calculated results, you will control your urge to chase high prices, and it will direct you to bargain opportunities to explore.